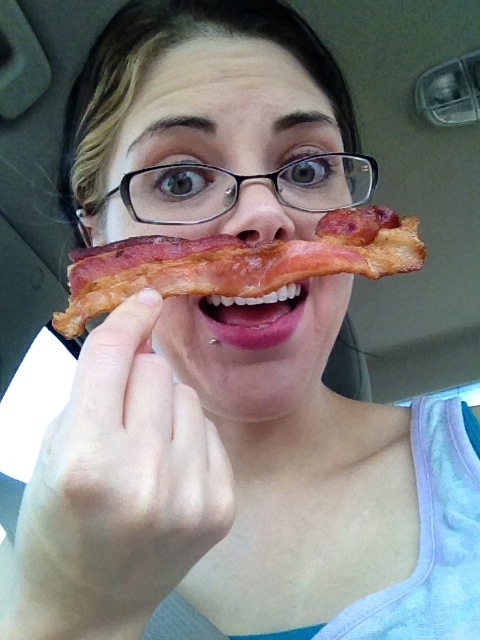 FREE Waffle House Bacon ‘Stash! As we were leaving Waffle House, the cook offered us free bacon-to-go! This called for a bacon ‘stash moment! Bacon 5K?!? Yuuuup! And I did it! On November 8th, The American Bacon Race came to Orlando. “Bacon Race?”, you ask? Yes, my bacon-lovin’ friend. Let me tell you all about it since I was lucky enough to participate in such an adventure…. The 5K took place at Harbor Park Loop in Baldwin Park, Orlando Florida. It was a morning run that turned out to have beautiful weather. The sky was cloudy at first but then cleared up and we had the perfect cool breeze to begin the run. When we arrived to pick up our packets, we were greeted by smiling faces and bacon being passed out to those waiting. My husband and I signed up with a group our friends Jill and Aaron started called “Nobody Puts Bacon in the Corner”. The ladies of the team made some awesome tutus for run. There were some amazing get ups by some very creative individuals. I was very tempted to gather my bacon from the event and use it as a trade for some of these outfits. I was very jealous. I did not go so far. I had the simple pig-tails and pink long sleeve exercise shirt, and wore the shirt given at registration. Even though, apparently to some full-time 5K runners, it seems to be a faux pas to wear the shirt of the vent you’re at. But I was proud to wear it! I KNEW this would win a piggy award! Mother and son bonding over the love for bacon! During the run was the best part. At the 1 mile, 2 mile, and finish, you got bacon to eat! I swear, with each bacon stop, I really felt like it gave me a boost of energy. I’m seriously thinking about taking a baggy of bacon with me to any other 5K we participate in. After the run, there were many delicious bacony treats to purchase. Everything was reasonably priced. The bacon sundae looked AMAZING. We strolled by as we picked up our finishing medals, but we did not partake. We were pretty much ready to go. 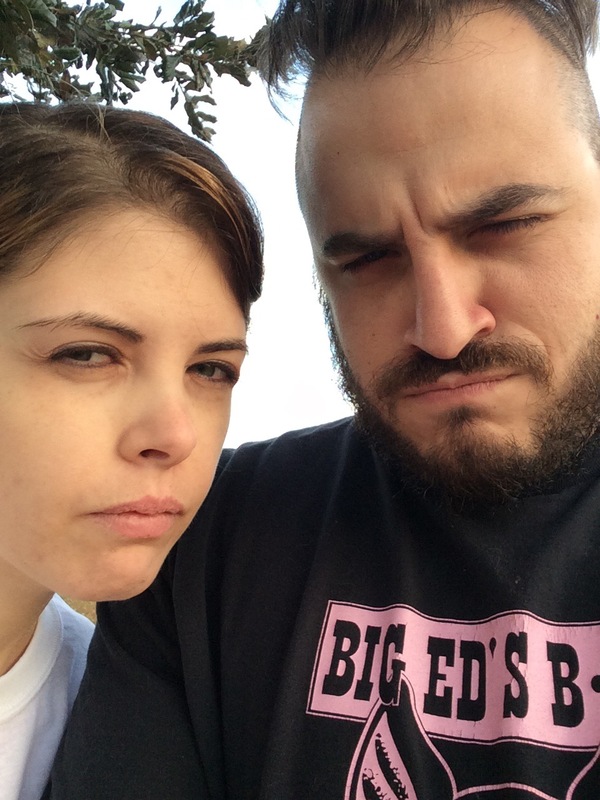 This was my first 5K and Ric’s second. It was truly a wonderful experience. I’m going to pat myself on the back for finishing the 5K and feel incredibly lucky to have been part of this one in particular. It was well organized and the vibe was all smiles everywhere you looked. I applaud how well this event turned out and look forward to the American Bacon Race coming back to Orlando again. Many more pictures can e found on American Bacon Race’s Facebook Page and also with Fixed Focus Event Photography. We will be buying our pictures through Fixed Focus soon and I will post these as an update on Twitter. The other day my husband and I stopped by Appleton’s Café in Lake Mary, Florida. This cute breakfast/brunch joint is always decorated for whatever holiday is coming up. Their food is always filling and delicious and their waitresses always smiling and fun to talk to! When we arrived last Thursday morning, it was all decked out for St Patty’s Day! I, of course, always order a side of bacon (4 strips) when I go. Their bacon is always crispy perfection and never soggy. This time around though, I was surprised with what I believe was finely chopped parsley on my bacon and toast! What a cute idea for a touch of green! 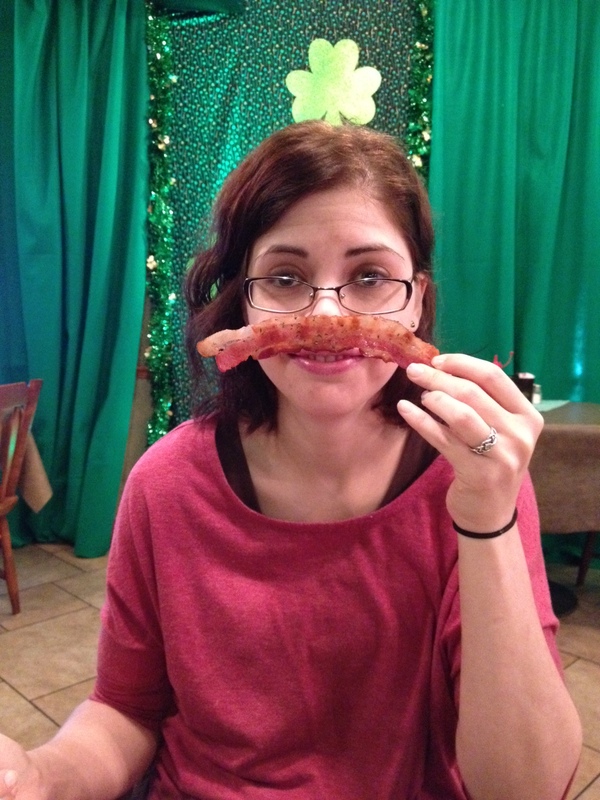 So, here’s the bacon ‘stash…..